The black H6 Omnidirectional Headset with Detachable Cable and TA3F Connector for AKG Wireless Transmitters from Countryman is a low-profile headset microphone that combines the transparent sounding E6 Earset with a comfortable, lightweight, and adjustable headframe. Weighing less than one-tenth ounce, it can be used as a water- and wind-resistant mic for capturing audio in houses of worship, theater, and outdoor vocal and speech applications. The low-profile, omnidirectional H6 Headset virtually disappears against the skin, so performers forget they're wearing a mic. Three sensitivity options cover general speaking to extremely powerful vocals, and four color options allow you to match the H6 to your skin tone for minimum visibility. The H6 features a sealed connector with moisture resistance, a slim cable, and protective caps (+0, +4, and +8 dB) to adjust the frequency response. The H6 is also available as a directional microphone with cardioid and hypercardioid caps. 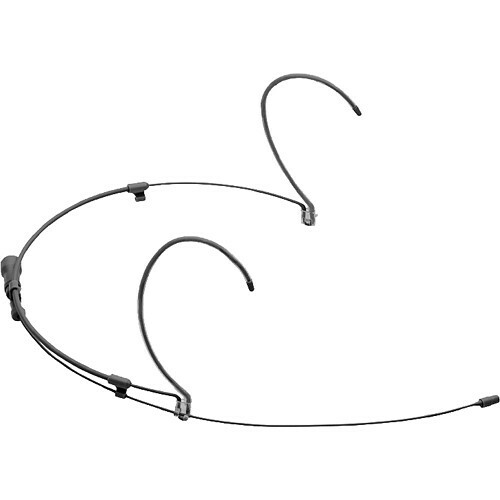 This omnidirectional H6 Headset's cable terminates to a TA3F connector for direct connection to an AKG DPT700, PT40, PT45, PT60, PT61, PT80, PT81, PT400, PT450, PT470, PT2000, PT4000, or PT4500 wireless bodypack transmitter.